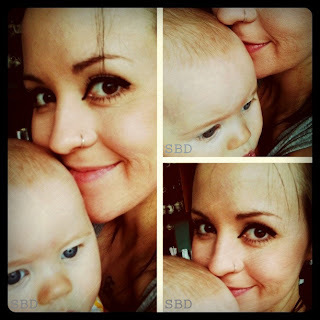 I discovered Mandy's blog a little over a year ago, while she was pregnant with her sweet smiley girl, Lily. I've learned healthy green tips from Mandy, watched her baby grow, and been encouraged by her beautiful perspective as a stay at home mom. I pray that you are blessed by her today! Hi, there! This is Mandy from "She Breathes Deeply." I am so happy to be here chatting with you all today! Bethany asked me to share some thoughts with you about my life as a homemaker. So, brew a cup of tea, and let's chat. To be honest, I am still pretty new to this whole homemaker position. I married the love of my life almost 3 years ago now. We welcomed the second love of our lives into the world almost a year ago when our daughter Lily Beloved was born. I wasn't necessarily planning on becoming a homemaker. The "position" was given to me, and I am honored, blessed, and humbled that I get to create a happy home for my family on a daily basis. Being a homemaker is an amazingly wonderful, rewarding job... But, it also is one of the hardest jobs I have ever held. I cannot tell you how many times I have found myself flat on my face, begging for the Lord to give me strength to be the wife and mother I need to be. Here are a few things I have found that are essential in my life to being a homemaker. All day, everyday. To be honest, this is an area I am working on. 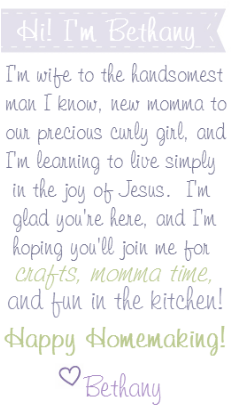 Jesus is the reason why we as women can create a loving, caring home. Without Jesus, I am nothing. I cannot do anything on my strength. 2. Creating a happy home is not about having an impeccable home. I am a tad O.C.D. I love having my home in order, clean, organized, etc. That is all fine and good, but sometimes it is not "real life." Homes are meant to be lived in... Which means messes a lot of the time. Lately, I have come to learn that it means a whole lot more to my husband and daughter to leave the mess, and go and spend quality time with them. 3. Allow yourself some "me" time. Yes, being a homemaker does mean a lot of self sacrifice. You learn to give, and give, and give some more of yourself to your family. This is why it is so important to find time to re-charge. You cannot continue to give and give, unless you allow your self a little "me time." That doesn't mean you have to spend enormous amounts of money going to a spa... It just means carving out an hour a week to read your favorite book, journal, get a cup of coffee with a friend. 4. Create a (loose) schedule. I'm finding that have a loose schedule really helps me get done the things I need to get done. Running a household can be an intimidating task. Prioritize what needs to get done, but if life gets in the way and gets busy, don't stress over little things getting done.
" A wife of noble character who can find? 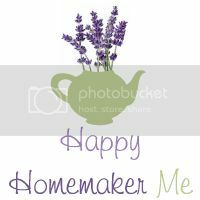 Have a wonderful day, homemakers! Your role in the home is so essential.. But remember you don't have to do it on your own strength. Fall madly, deeply in love with Jesus and allow him to carry all your burdens. Thank you so much for having me, sweet lady!